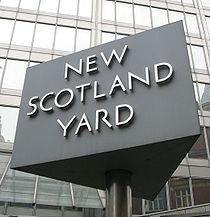 On Wednesday 9th May 2012, a small group of APT’s met outside New Scotland Yard, London to visit the Crime Museum, formerly known as The Black Museum, situated inside the Crime Academy of the Metropolitan Police. The Crime Museum opened in 1875 and was the idea of an Inspector Neame who had collected a number of items and wanted to help teach police officers how to detect and prevent a burglary. With the help of another officer, a P.C Randall, he gathered materials from old and new cases to create a proper museum. From what we saw as we were ushered out of a lift by the Crime Museum’s Curator, the Crime Museum is housed in at least one half of the first floor of New Scotland Yard; with old-fashioned paintings portraying police officers and other related scenes adorning the walls leading up to the museum itself. The museum is used as a teaching aid for police officers and support staff and is not open to members of the public, but thanks to Ben Deakin, a few were granted permission to visit and take a look around. As the curator unlocked and opened the plain wooden door, we were greeted by a cabinet full of weapons and a shelf full of "death masks", which, as the curator explained, were casts taken of people who were hanged at Newgate Prison in order for scientists to see if they could predict whether a person could commit a crime due to the shape of their head. For the official start of the tour, the curator directed our attention to a particularly gloomy corner of the room where a glass cabinet full of what looked like old robe stood. Upon closer inspection, this old rope turned out to be a set of hangman’s noose’s dating from the 19th century right up until the last recorded hanging in 1964. The cabinet even contained a fresh noose, never used in an execution. Some of the noose’s were labelled with the name of the person that they had been used on, the most famous being Ruth Ellis; the last woman to be executed by hanging in England. Next to this cabinet was a small display dedicated to one of the most famous executioners in England, Albert Pierrepoint. Contained in this display was Albert’s pocketbook containing all of his trial and error calculations regarding rope length in relation to a person’s height. Sitting directly adjacent to the "hangman’s corner" was the display which, for me, was the most fascinating. Held in this cabinet was all of the items relating to England’s most famous serial killer, Jack the Ripper. I’m sure that I am not alone in being interested in this case, the movies, books and conspiracy theories do nothing to sate my curiosity. 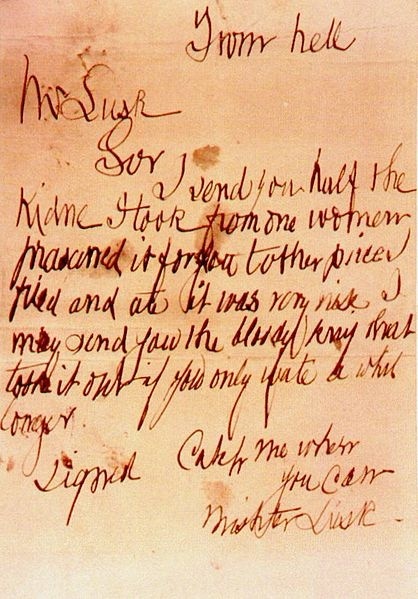 I once even went on a midnight cemetery tour in Liverpool to visit the supposed grave of Jack the Ripper. So, for me, to actually see official pictures, letters and look upon the original Robert Anderson book, “The Lighter Side of My Official Life” was, in fact, something I can now cross off my bucket list! Also housed in this particular cabinet were some particularly gruesome items showing how insane people can be; a spurned husband who fashioned some binoculars as a gift for his wife only with an added surprise. As she would put them to her eyes, some pretty sharp spikes would pop out, no doubt causing some discomfort. The curator then began to describe to us what was contained in the weapons cabinets. Guns from some of the most famous assassinations and assassination attempts in the world have been kindly donated to the museum by police forces from across the world. One such example is a bullet pulled from the body of John Lennon after he was shot by Mark David Chapman. Some of the weapons held in the museum are most definately a good teaching aid for members of the police force as well as being useful for us in our profession, at least for me anyway. It was fascinating to see how criminals can fashion a weapon from just about anything; from mobile phones being fashioned into stun guns and pens being able to shoot bullets. One particularly surprising item, for me, was a belt buckle looking completely normal and then as soon as it is undone, it turns into a small knife. It has certainly made me a lot more suspicious when I’m in the post-mortem room now! The curator then hands us some electronic guides and tells us that we are free to explore the rest of the museum at our own pace. The first thing that piques my interest is the bath sitting next to a gas cooker, with a large pan on it against one wall. Once I have entered the exhibit number my trusty handset goes onto explain to me that these items were taken from the house of Dennis Nilsen, affectionately known as The Muswell Hill Murderer. Nilsen was responsible for at least 15 murders of young men that we are aware of and attempted to dispose of his victims by storing their larger limbs and organs in his wardrobe, boiling their heads, hands and feet and flushing any smaller parts down his toilet. This method of disposal is what ultimately led to his capture and subsequent imprisonment. Placed in the cabinet next to Nilsen’s gruesome artefacts are some exhibits remaining from the case of John Haigh, the Acid Bath Murderer. His apron is given pride of place right next to some dentures of one of his victims that the acid did not dissolve. Other cabinets dotted around the museum are dedicated to different topics such as poisoning and drugs, with a lot of space being taken up by items related to terrorism. It was interesting and rather frightening to see how easy it is for people to create items which cause so much destruction. I actually take back all of the bad thoughts I directed to airport security for not letting you take liquids (mainly perfume for me) onto the planes when you can see how simple it is for someone to use that to their advantage. Considering how infamous the Kray twins are, I expected a bigger exhibit dedicated to them. The one in the museum had a few items in it, particularly a briefcase belonging to them containing syringes that are able to shoot out of it. There is even a cabinet dedicated to The Great Train Robbery, one of the most famous heists in history, containing a letter from Ronnie Biggs, dated 2001, asking then Prime Minister Tony Blair, if he could return to Britain. The most sobering sight for me though has to be all of the exhibits dedicated to the police officers who have been killed while in service. All of the gruesome items in this museum didn’t make me feel as sick as seeing all of the uniforms with their bullet holes in and in some cases, particularly that of Yvonne Fletcher, the actual bullets taken from their bodies. If the opportunity to visit this fascinating place should come up again, which I hope it will, I would recommend that everyone should go!